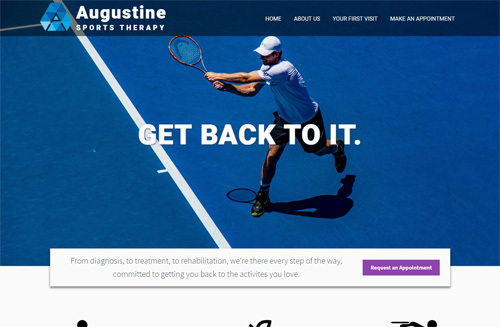 Find a template to use as a starting point for your site. We can add any feature to any template so simply pick one with a look and feel that appeals to you. Augustine is a highly dynamic theme, with lots of animated elements. It also shows an example Appointment Request Form, although the theme can be customized to fit any site type. Haymarket is a natural and simple design for emphasizing three to five different features of your business. 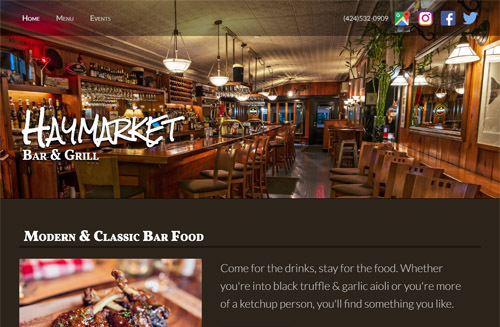 This example is set up for a bar and grill, but can be customized for other site types. Modern and friendly, Kiowa is ideal for showcasing images. 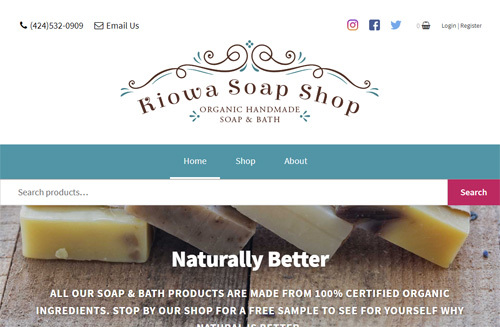 This example is set up for a brick-and-mortar store that also sells online, but Kiowa works well for all site types. Kapok is a simple, elegant theme. 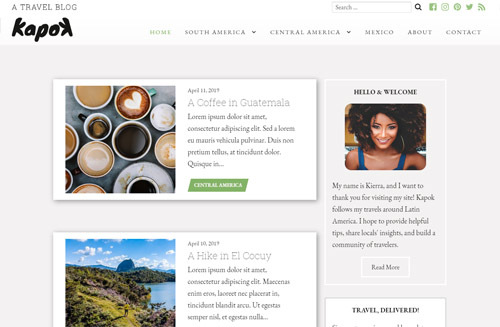 Although the theme can be customized to fit any site type, Kapok is designed with blogs in mind. 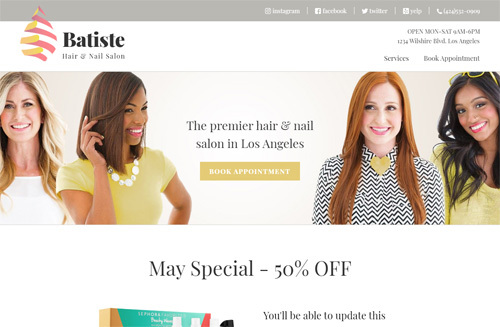 Give your online presence a big, bold look with the Batiste template. This example is set up for beauty salon, but can be customized for other site types. 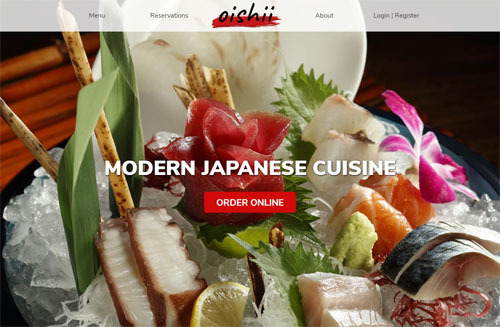 Oishii is a clean, eye-catching template that uses lots of high quality images. This example is set up as a restaurant that also lets you order online, but the template can work for any site type. Angular and crisp, Latigo is optimized for profiles for individuals like personal trainers, real estate agents, and actors. 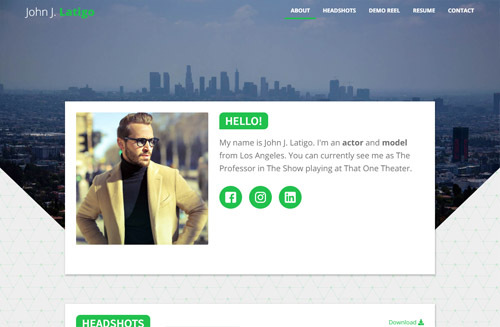 Use Latigo to showcase what makes you the best at what you do. 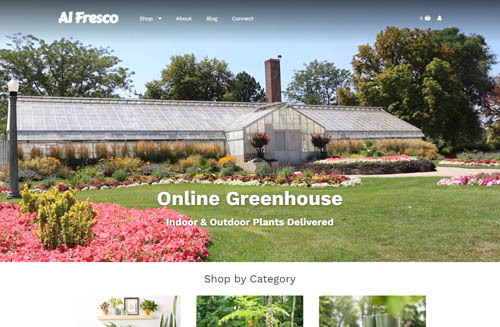 Al Fresco emphasizes beautiful imagery. From the video background header on the home page to the full-width feature images on the blog posts, this theme is sure to make an impact.